You may be surprised to hear that multiple star systems are estimated to be twice as common as single stars, in our Milky Way at least. I suppose the one that everybody with an interest in these things has heard of is the binary system, consisting, obviously, of two stellar objects orbiting each other, but that is by no means the limit. Let's consider that first, anyway. As with any multiple star system, a binary system consists of stellar objects orbiting round a common centre of mass. Here we see, within the small square marked near the centre of the image, the binary system BG Geminorum. Found in the constellation Gemini, some 7340 light years distant, it is made up of a primary star that could possibly be a black hole and a secondary star orbiting round it that is classification K0, which is an orange dwarf. This serves to illustrate how difficult it is to identify these phenomena optically, as the further away the system is, the more it looks like a single object. We have the large dominating object Sirius A and its small companion (lower left), Sirius B. Those binaries that are detected optically are termed "visual binaries". If a two-star system orbits with its plane aligned along the line of sight from Earth, so that one star appears to pass periodically in front of the other, this is known as an "eclipsing binary". Finally, some binaries consist of stars that are really close together, astronomically speaking, resulting in matter being exchanged between the two. These are termed "close binary systems". 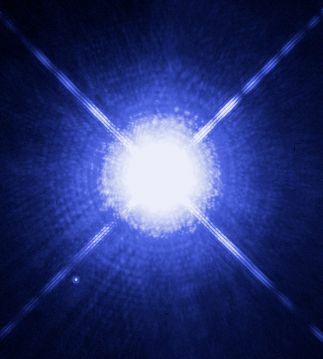 The example Sirius, above, is one such. Although open clusters of stars or even whole galaxies can be considered "multiple star systems", the true definition is three or more stars that can be observed as physically close to each other, with interacting gravitational fields. Some may be in stable orbits around each other and are referred to as "hierarchical systems", whereas others may be totally unstable with wildly chaotic orbits, termed "trapezia". There are also some systems that only appear to be close together when viewed from Earth and these are called optical multiple star systems. The three-star system is, by far, the most common in the galaxy. The famous star Alpha Ursae Minoris, otherwise known as the North Star, the Pole Star, or Polaris is such an example. This is the 45th brightest star in the night sky and has been observed since the time of the ancient Egyptians. However, it wasn't until 1780 that astronomer William Herschel discovered the main star's first companion, designated "alpha UMi B". 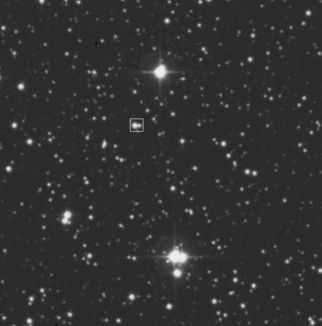 The third star in the group, "alpha UMi Ab", wasn't discovered until 1929, as it is so close to the main star as to make it virtually unobservable. The main star, "alpha UMi Aa", is a yellow supergiant. 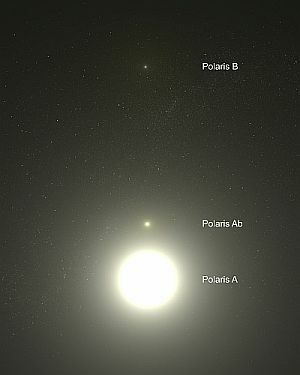 Polaris B orbits at a distance of 223,093,936,411 miles, while Polaris Ab, a dwarf star, is a mere 1,719,682,426 miles out. In this graphic, example d is hierarchy 2, while e is hierarchy 3. Here we have an artist's impression of the quaintly named HD 98800, situated about 250 light years away in the constellation Crater. As you can see, it looks like two separate binary systems and, indeed, the two pairs have a distance of 4,647,790,342 miles between them. 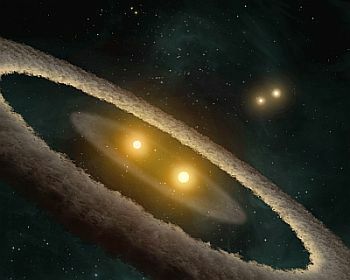 All four objects are known to be gravitationally connected, however, enabling it to be considered a quadruple system. There is an example of a quintuple star system in the constellation Orion. Situated just below Alnitak, the left-hand star in Orions's belt, "nu Orionis" has five stellar objects, designated alphabetically A to E. The main two stars, A and B, are extremely massive and bright, while the three others are much smaller and fainter. The higher the number of stars, the rarer they are. However, it has recently been discovered that a sextuple star system exists in the constellation The Big Dipper. One of its brightest stars, Alcor, long known to be a binary system, has been found to be gravitationally bound to the four-star Mizar system, resulting in a six-star combination. How high can we go? Well, in the constellation Cassiopeia, we have AR Cassiopeiae, which is a septuplet system. There is only one other seven-star system known to exist - nu Scorpii. No multiple star systems with more than seven components have been discovered...yet.